Pardinho was eventually taken to a baseball field and thus began his love affair with the game. While the 15-year-old pitcher doesn’t necessarily rely on his hitting skills anymore, he is part of a new crop of Brazilians playing baseball instead of the nation’s most popular sport — soccer. 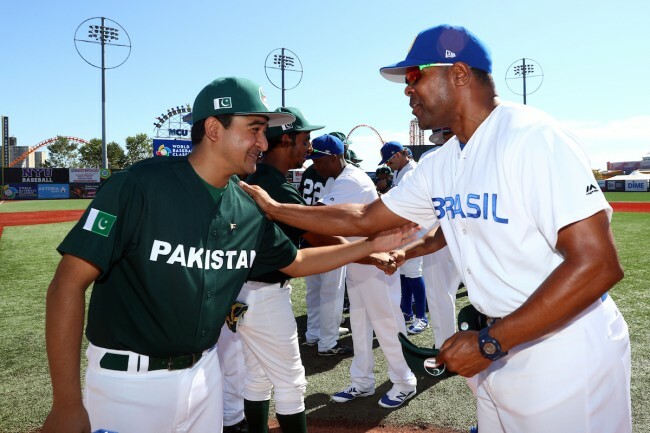 There are a myriad of opportunities to learn and develop baseball skills in countries like the United States (it is called ‘America’s pastime’ after all), Japan, South Korea, Dominican Republic, Venezuela and so forth, but the facilities and opportunities are comparably barren in nations like Brazil. Yet, Brazil is being considered by some as the next big baseball market — an untapped plethora of riches and talent. Major League Baseball established a national training center there in 2010 and the league holds an annual Elite Camp for 14-17 year-olds in the country as well. MLB Hall of Fame member Barry Larkin has been an active participant in those camps. It’s how he became Brazil’s manager for the 2013 World Baseball Classic and was reappointed for the 2016 WBC Qualifier in Brooklyn, N.Y., earlier this month. Baseball was first introduced to Brazil, the fifth-most populous country in the world, by the Japanese in the early 1900s, who emigrated to escape poverty and unemployment in their home nation. Brazil is home to the largest Japanese population outside of Japan — approximately 1.8 million people of Japanese descent live in the country. So it’s no surprise Brazil’s national team has a Japanese influence. Players including Felipe Fukuda, Hugo Kanabushi, Claudio Matumoto, Bo Takahashi and Vitor Ito are of Japanese descent. There are also many Brazilians who play professionally in Japan. The Brazil team that played in Brooklyn also had four Cuban defectors on its roster — Ernesto Noris, Irait Chirino, Angel Luis Cobas and Juan Carlos Muniz. The amalgam of players like Takahashi (Japanese-Brazilian), Pardinho (Brazilian) and Dante Bichette Jr. (Brazilian descent) signify the sport’s growing popularity in the culture and country. Bichette Jr., who was able to play for the national team with brother Bo because their mother, Mariana, was born in Port Alegre, Brazil, said representing the national team not only meant a lot to him, but to his family as well. The Bichettes’ maternal grandmother is a lifelong Brazilian and their grandfather is a native of China who emigrated to Brazil. Both were in attendance over the weekend. The Bichettes, Takahashi, Pardinho and every player on the roster is trying to follow in the footsteps of the successful Brazilian baseball players. Paulo Orlando is an outfielder with the Kansas City Royals, Yan Gomes is a catcher with the Cleveland Indians and pitcher Andre Rienzo has played in the MLB with the Chicago White Sox and Miami Marlins. Grant Wahl joined Sports Illustrated in 1996. Coincidentally, Major League Soccer played its inaugural season that same year in the United States. Over the course of the past 20 years, Wahl has seen soccer and the MLS grow and improve in America. The league itself has doubled since its inception from 10 to 20 teams, will expand to 23 by the 2018 season and can be seen weekly on Fox Sports 1 and ESPN. Muhammad Sumair Zawar proudly stepped to the plate wearing a dark green jersey with ‘PAKISTAN’ written across the chest in white lettering and the nation’s flag emblazoned on the right sleeve. He watched the first pitch from Brazil’s Jean Tome whiz by him.